41718-CZ is rated 4.9 out of 5 by 10. Rated 5 out of 5 by ColoradoChris from Great investment for my bathroom remodels! I purchased this grab bar for each of my new showers in my remodeled bathrooms thinking that even if I didn't need it, at least it would be installed for the homeowners who would own this house after me. Little did I know that I would be the one who would actually need it! Soon after these were installed, I learned that I need to have both my hips replaced. It is painful to walk and to transition from sitting to standing. Thank heavens for these grab bars! They definitely make my life easier! This design looks sleek and the bar itself is more of an oval shape rather than circular which is more comfortable in the hand. This model is part of a series in the Champagne Bronze color that Delta offers and it looks great with the shower head and other grab bars. Note the corner shelves with grab bars on top of them that are in the second picture here. In addition, I bought the towel bars with grab bars on top of them and toilet paper holders with grab bars on top of them. I particularly like that one item - a towel bar for instance - can also function as a grab bar with the grab bar on top of the towel bar and parallel to it. Great features with dual functions! And they all look sleek and beautiful! So glad I made these purchases! Rated 5 out of 5 by Janet from Great item We recently installed this grab bar in each of our remodeled baths. The peace of mind by having these is wonderful - the safety of having them to assist in getting in and out of the shower is priceless. Rated 4 out of 5 by Enn from Delta 41718 18" Grab Item was delivered on time. 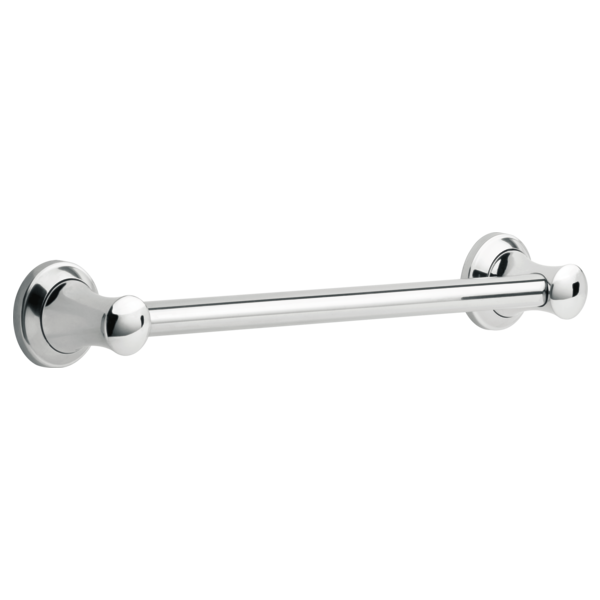 Rated 5 out of 5 by Dede from Classy grab bar Love this grab bar. It looks great in my renovation of our bathroom. Rated 5 out of 5 by Rosemary from Great fit I just started using this and it is very sturdy and beautiful! It was a bit tricky to install, but now it will help me pull up and I'm a big girl! I have no worries about me pulling it out of the wall. We did add wood bracing behind the tile for extra support. It matches my fixtures and I love it! Very well made. Can this be used on a custom glass shower door as a handle? Looking for Champagne Bronze Glass Shower door handles and Hinges to match all the delta products we chose for a remodel. Please let me know if you have them or a supplies that matches with the same finish. Thank you! The grab bar - is the bar solid round or is it open/hollow in the back? How much weight is this grab bar designed to safely handle? &nbsp;I saw 500 pounds described on a 1 1/2 inch bar. What is this one designed for?